The Hawks and Mavericks executed a trade on draft night that added a spark to both team's rebuilds. Now, with Trae Young and Luka Doncic under the microscope, we'll watch them experiment in real time. The NBA has become an 11-month sport over the past few years, but we are now in month 12. The news has slowed to a trickle comprised of sketchy after-party fights, half-hearted Carmelo Anthony arguments, LeBron James Jr. highlights, and Kevin Durant's Twitter. It's August. The offseason is real now. To celebrate the spirit of wandering in the middle of nowhere, let's talk about the rebuilding approaches of the Hawks and Mavericks. For the past two months I've been thinking about their decisions more than I care to admit, and if we are in a safe space free from judgment, I might even argue that these teams just had the two most interesting offseasons in the league. Here are seven points to consider. 1. Assessing that draft night trade depends almost entirely on what you think of Luka Doncic. When the Hawks dealt Doncic to Dallas in exchange for the fifth pick and a top-five protected future first-rounder, it guaranteed that these teams will be intertwined for at least the next few years. For Dallas, that deal was a bet on Doncic as the cornerstone of the future, and if he can play that role, he's definitely worth a pick in the middle of the lottery. 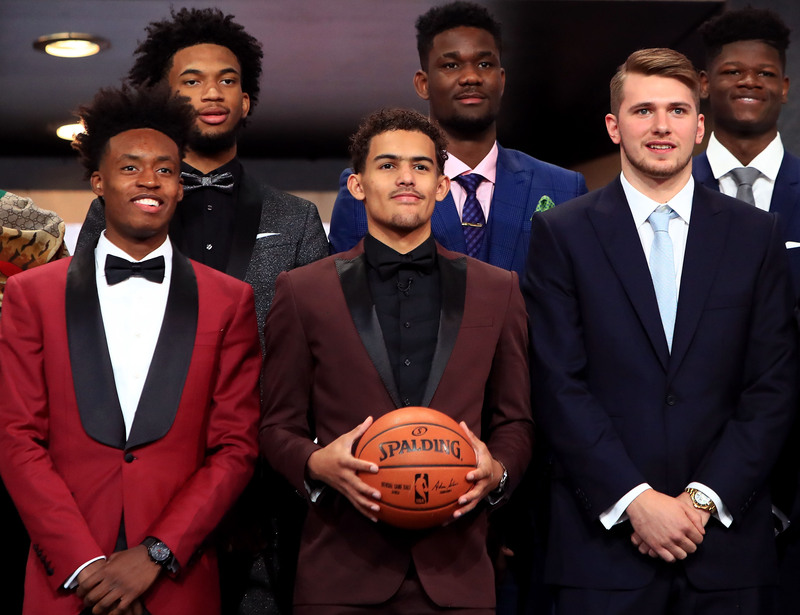 For Atlanta, the trade was a bet on Trae Young and future picks, but it was also pretty clearly a bet against Doncic. If Atlanta didn't think he had a top 3 value, capitalizing on the misplaced hype made sense, and the Doncic trade was this year's version of the Jayson Tatum deal. 2. So how good is Doncic? This is tricky. Doncic is the most celebrated prospect to hit the NBA since Ben Simmons, and it's almost a guarantee that he'll be good in the NBA. All criticisms here are relative. So with that disclaimer out of the way... Doncic hype was a lot to handle. The further the draft process went, the greater the disconnect was between what the basketball internet thought of Doncic and what actual basketball teams thought of him. The former argued that he was the most skilled player in the draft, he'd just dominated the second-best league in the world at 19 years old, and it was insane to pass on a player with those credentials. In the eyes of believers, he was like Slovenian James Harden, or a bigger Manu Ginobili. Anyone who doubted Doncic was either overthinking his flaws or underselling his strengths because they didn't appreciate the quality of Euroleague basketball. Enthusiasm among NBA teams was more measured. One scout described Doncic to me as "Hedo Turkoglu and Joe Johnson if you put them in a blender." That's a really good player, but not quite Slovenian Harden, and maybe not even Gordon Hayward. Doncic was very good playing in the second and third best leagues in the world—Euroleague and Liga ACB—but those leagues are great because of their skill. The athleticism of guards in Europe is still several steps below the NBA, and lags behind even the college game. Doncic was historically good for his age, but it's fair to wonder how much of that success will translate. I think he will have a good rookie year. I’d guess 12-14 points, four rebounds, and four assists per game. He can do a little of everything. He can’t play point guard in the league because he’s not athletic enough, he’s a wing. His pick-and-roll ability, pace, change of speed, high IQ and size will be excellent for the league. Obviously, he was playing against professionals, so this is better competition than Summer League and all those things. He’s ready, I just wouldn’t say he’s Dirk, Pau or Marc like they are trying to say. It’s easier for euro bigs to adjust (to the NBA) than guards. It’s just easier overseas because if you’re 6’6-6’8 and you can dribble, shoot, play iso, and play pick-and-roll (like he can) you’re already in the NBA. So there aren’t a lot of teams that can matchup with his size in Europe. I’ve seen what happens to him when he goes against players his height or close-to who are athletic. He struggles mightily. Go check the film in Panathinaikos series. He was struggling to create space, to get the team in the offense comfortably, and to create shots, and get by guys. Granted Panathinaikos is the most athletic team in Euroleague, but that’s kind of athleticism he will see in NBA. But he’ll be a very good professional, he’s ready and he will make an impact as a rookie. I feel like he caps out at 18 points per game, which is excellent in the NBA. It’s just not a superstar or a guaranteed All-Star every year. I feel like if you’re picking at one, you’re drafting a player to be a number one option, a franchise changer. And he is really good, but if he’s your best player on a team in the NBA, you won’t be a contender. If he’s your second-best player, your team will fight for playoffs and if he’s your third option, I think that team is really good. 3. Then there are the warped dimensions of any Trae Young conversation. He drew Steph Curry comparisons during his only college season, and those were always destined to end badly. Steph is the greatest shooter the NBA has ever seen. Comparing Trae Young to Steph is like comparing Deandre Ayton to Wilt. So in that sense, it became fashionable and reasonable to side-eye the Trae Young hype as the draft process unfolded last year. He's small, he'll struggle on defense, his shot selection is downright appalling at times, and for a player whose offense will have to compensate for built-in deficiencies on defense, it's not a guarantee he'll be able to create space in the NBA. There are reasons to pause before anointing him a star. Then it seems like the pendulum swung too far. Debunking Curry comparisons became so commonplace that a lot of people accidentally dismissed Young's upside altogether. That's a mistake, too. Young can operate incredibly well in tight spaces, and he's a better passer than he is a shooter. If you appreciate his upside as a potential Steve Nash or even Damian Lillard, the hype begins to make a lot more sense. If his scoring translates from the perimeter, he's going to be really dangerous at the next level. Young looks like the inverse of Doncic. His ceiling and star potential is indisputable, but the floor is much scarier—there's a chance that he just isn't good. Also, the NBA isn't Oklahoma. If Young takes one too many 35-footers next season, he might get attacked by his teammates. 4. The rest of the Mavs and Hawks offseasons followed the same pattern as draft night. Dallas drafted the most NBA-ready prospect on the board, traded away a future first, and then signed DeAndre Jordan to help solidify next year's core for a nominal playoff push. Atlanta parted ways with Mike Muscala, added Jeremy Lin and Alex Len as placeholders, and began playing for the future. Last week they traded Dennis Schröder to OKC for a 2022 lottery-protected pick and the right to buy-out Carmelo Anthony's deal. Schröder isn't necessarily good—my colleague Ben Golliver once said, "'Schröder' is the German word for 'Brandon Knight'"—but he's decent enough to make next year's Thunder look more interesting and prompt a double-take at the team that just gave him away. Instead of running it back with Schröder and pairing him with Doncic on the wing, the Hawks chose long-term flexibility (shedding the remaining $45 million on Schroeder's deal), future picks, and a blank slate in the short term. 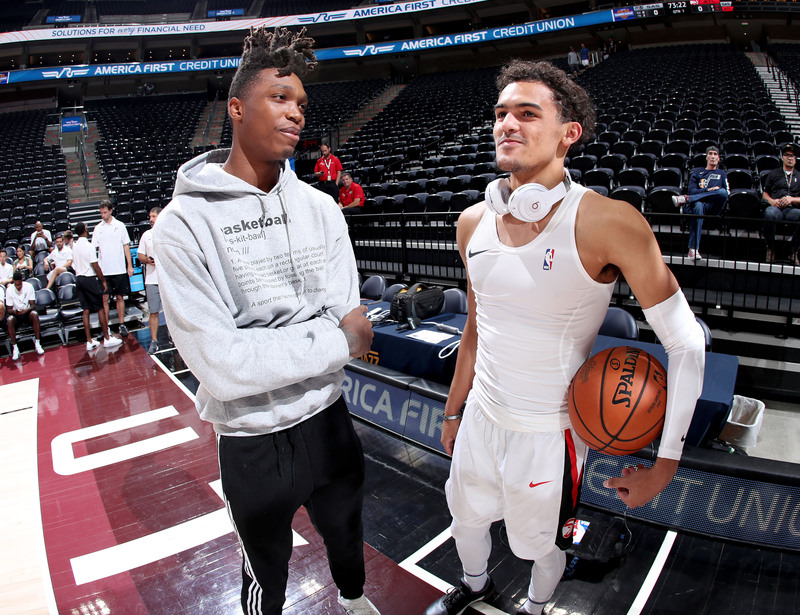 They will head into next season with John Collins, Trae Young, Taurean Prince, the ghost of Jeremy Lin, and... not much else to look forward to until the 2019 draft. 5. It's easy to be cynical in either direction. Look at the rest of the Western Conference and it's clear that any Mavs playoff dreams are probably going to look ridiculous by January. It's still a mystery as to why they went after DeAndre Jordan instead of Clint Capela—if anything, why wouldn't Cuban do this to screw with Daryl Morey?—and after this strange season with DeAndre, they'll be back to square one with cap space they probably can't use on a superstar. Harrison Barnes remains perfectly fine and nothing more. Dennis Smith is undersized and doesn't play defense, but unlike Trae Young, he can't shoot or pass, either. Dirk is never retiring, but he's also not really Dirk anymore. Doncic probably won't be the Nowitzki heir the internet expects him to be, while Rick Carlisle is still there to stubbornly scoff at the notion of tanking, which means the Mavs probably won't have another top 5 pick until 2030. Atlanta has just finished forging a future that will look great on NBA Reddit and could be absolutely miserable to watch for the next several seasons. They are homeless man's version of the Warriors while also executing a cheap knock-off of The Process. The lottery-protected pick they got in the 'Melo deal may never convey—by 2022 the Russell Westbrook experience will be very much on its last legs. Likewise, despite Carlise's best efforts, lottery reform will give the Mavs some hope of keeping next year's pick even if they miss the playoffs. For that matter, lottery reform could just as easily hurt Atlanta's own pick. There's also a top-10 protected Cavs pick that may convey next year, so that's one more asset that probably sounds better in theory that it will be in reality. These are the things Hawks fans will be thinking about on nights when Trae Young is going 8-27 during 30-point losses next year. Will Carmelo and the Rockets Prove to Be a Doomed Marriage? 6. These plans are fearless and possibly reckless, and that's what makes them great. Both the Hawks and Mavericks committed to visions for the next five years, and they went all-in. For the record, the Mavs aren't totally crazy for looking at the current NBA landscape and concluding that the best way to build a title contender is by lucking into an undervalued young superstar, building toward the middle, and betting that you can sign or trade for additional stars to hit the upper echelon from there. That's what the Rockets have done, and it's also what the Mavs did with Dirk a decade ago. If Doncic is as good as his believers expect, this could get fun very quickly. Conversely, the Hawks have topped out at "good, but obviously not great" twice in the last 15 years. Atlanta may as well be Siberia when it's time to sign star free agents. Given the recent history and those limitations, it makes sense for the front office to tear it all down and hope to luck into someone who is good enough to change the story. All Warriors comparisons need to be banned as soon as possible, but in general, this plan comes with more hope than Atlanta has seen in several years. More than anything, I appreciate the conviction on both sides. Atlanta is hoping to get lucky with Young and a future full of lottery tickets, while Dallas is convinced that they already hit the jackpot. Next to a NBA full of bottom-tier teams that can't quite decide what they're trying to do every year, the Mavs and Hawks have made their plans clear. 7. Now we have an experiment that will play out in real time. It's like bringing a Twitter argument to life. One team is re-engineering The Process while the other is refusing to indulge another year at the bottom, and because of Doncic, we're going to spend the next several seasons comparing their progress. Eventually there will probably be extenuating circumstances that complicate how we understand the success or failure of any of this, but that doesn't make this summer's question any less interesting. Five years from now, Hawks or Mavs: Who ya got?